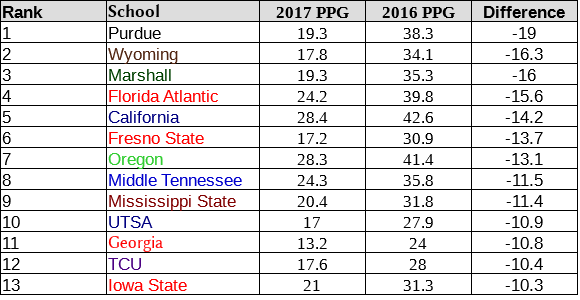 The Cowboys are second in the country and just one of 13 teams heading into the college football bowl season to have seen a double-digit improvement in their points per game allowed from the 2016 to 2017 football seasons. The one school ahead of Wyoming, the Purdue Boilermakers, also had a first-year defensive coordinator and they actually had two with Nick Holt and Anthony Poindexter serving as co-defensive coordinators in West Lafayette, Indiana. Wyoming has played two other schools on this list (Fresno State and Oregon) and unfortunately lost both games at home. The future is bright with the Wyoming defense as 8 starters on the current depth chart return for the 2018 season.